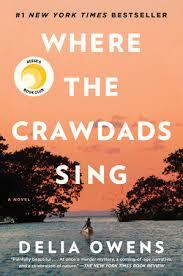 “Where The Crawdads Sing” is the first novel by Delia Owens and she goes all out telling the story of the Marsh Girl, the football quarterback handsome Chase Andrews, and Tate Walker. The Marsh Girl is Kya Clark who has lived by herself since she was ten in a cabin in the marsh of North Carolina. Abandoned by the other family members one by one, she worries about the truant officer, boys and others coming by her shack. And yet she seeks out Jumpin' who pays her for the fish she's caught and his wife Mable who gives her clothes, hand-me-downs that the other kids have outgrown. Enter Tate Walker who taught Kya how to read and then went to college. Seems everybody leaves. Except Chase, who is found dead in 1969 by two boys who are going up the steps to the fire tower and Kya is the suspect. Except at her trial, her lawyer gives an incredible closing. Interweaving the time the author has set up a credible story of the 50's, 60's, and 70's. Back before the technology of today when kids used “hang out”. And Owens gives the readers beyond that to the end Kya's life. Part murder mystery, an ode to natural history, and coming-of-age story, “Where The Crawdads Sing” by Delia Owens is in the Moniteau County Library in California.